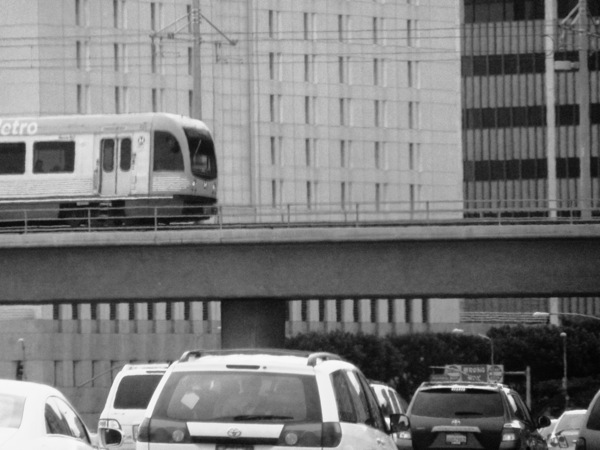 A very nice photo of the Gold Line crossing the 101 freeway in downtown Los Angeles taken by Ilda, who is an administrative analyst for Metro. The photo neatly follows the “rule of thirds” — meaning no part of the image dominates the middle of the frame. It works and you can see evidence of that in Ilda’s photo: the train is on the left side, the cars in the bottom third of the frame and the buildings in the background dominate the upper third of the frame. To my eye, it feels like a properly balanced image and it helps that it’s in black-and-white. Many different shades of gray are in the frame.